Why should I buy BigH TrapsTM instead of regular Glue traps? How Do BigH TrapsTM work? Brown Recluse Spider bites can make the victim very sick. If you are bit, seek medical attention! 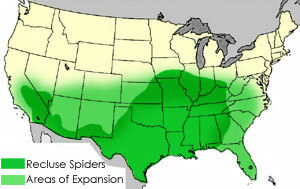 But don't wait to get bit; get rid of your Brown Recluse Spiders today the most effective way. 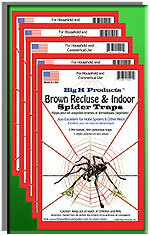 If you live in Brown recluse territory, our Big H TrapsTM are recommended by spider experts for controlling Brown Recluse Spiders instead of poisons and pesticides. Rather than exposing yourself and your family to poison (sprays & pesticides), place non- poisonous and natural-attractant-baited Big H TrapsTM to trap Brown Recluse Spiders when they move into your homes to keep you feeling safe. To use the traps most effectively for brown recluse spiders, place traps in closets or other secluded areas where you have seen spiders and/or webs. When people put on clothing or shoes (containing a spider) that were left on the floor overnight when the spider crawled into the object. When people blindly pick up or grab objects with out gloves in a secluded or rarely visited area. When people roll over in bed on a spider that had climbed up the covers that were touching the floor. Where can I buy BigH TrapsTM? If your area doesn't have a local dealer, click here to download a referral sheet in pdf format, fill out your information, then give it to one or several businesses in your area you think would be interested in becomming a dealer. Buy them online. Click here to order Big H TrapsTM online and have them delivered to your home.